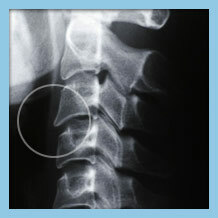 How Do I Know if I have Spinal Bone Spurs? Spinal bone spur symptoms include pain that radiates along the nerve path into the arms or legs. Numbness, tingling, and a pins and needles sensation are also common spinal bone spur symptoms. The longer the condition progresses the more compression the spur will place on surrounding nerves which may lead to muscular weakness and loss of motor function. Do you have any of these symptoms and think you may be suffering from a spinal bone spur? We have a quick and easy tool to help gather some information from you to help us determine what your problem is and get you on the road to recovery. Spinal bone spur treatment usually involves anti-inflammatory medication, rest, activity modification, exercises to strengthen core muscles that provide support for our back. If needed, physical therapy will be added to the treatment plan. Only once conservative treatments have been exhausted should surgery be considered. OLSS provides a wide range of treatment options and because our doctors are the most experienced and best trained in treating spinal bone spurs we are able to perform many advanced treatments other practices are unable to offer. The real question is: What treatment is best to treat your spinal bone spur? Use our Treatment Match tool to quickly get started in finding the right treatment for you.